March | 2014 | Small Farmers. Big Change. People often confuse the terms. They sound so similar. Free and Fair. To the uninformed, they even seem to go hand in hand. Yet, no two concepts could be further apart in terms of what each represents as an idea and what impact each has on small farmers, workers, consumers, local communities, the environment, and so much more. If you’ve ever found yourself confused about the terms, click here to watch a short video created by our friends at Fair World Project. In a clear and compelling way, the video demonstrates how current free trade agreements harm small farmers and workers in both the global north and south and then explains the dramatically different approach behind Fair Trade. The video ends with concrete ways in which you can support Fair Trade brands and policies that place people before profits. 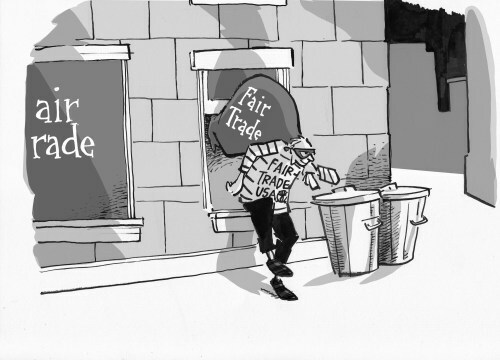 At the end of the day, because free trade and fair trade are in such stark opposition to each other, with the former placing the needs and interests of corporations first and the latter focusing on people and the environment, it is important that we all act with our dollars and our votes to ensure the kind of world we all envision to be possible. The EE Banana Conference… It’s Around the Corner! !